I went to the Roosevelt Island Resident's Association Common Council meeting Wednesday night. The meeting started with a presentation by Thom Sokoloski and Jenny-Ann McCowan of the Encampment public participatory art project that will be installed at Southpoint Park during Open House NY from October 5-7. They gave a well received presentation to the Council members and reiterated their call for creative collaborators from the Roosevelt Island community as well as sponsors for individual tents. They are currently on Roosevelt Island so if you are interested in participating in this project they can be reached here. Assemblymember Micah Kellner then reported on matters of interest to the Roosevelt Island community including a potential new buyer for Island House but not Westview as well as his Roosevelt Island office hours. A recent Main Street Wire article on issue of the sale of these buildings is here. A long and fascinating conversation among the Council members then ensued regarding whether or not RIRA should accept unrestricted funds from the RIOC President's discretionary allotment that would be used for financing the RIRA sponsored plebiscite, but not election - repeat not election, of the Governor's nominees to the RIOC Board of Directors. Issues involving the balance between pragmatic local politics, governmental transparency and ethical considerations were robustly and vigorously debated. The motion to accept the funding was passed. Unfortunately, after 2 1/2 hours I had to leave while the meeting was still in progress so I do not know if there were any subsequent developments. Check out this week's Main Street Wire for more comprehensive coverage of the meeting. The main impression I walked away from at 10:30 PM was that the RIRA Council members, all Roosevelt Island residents and our neighbors, are performing a great public service and deserve our respect and thanks for their service to the community. 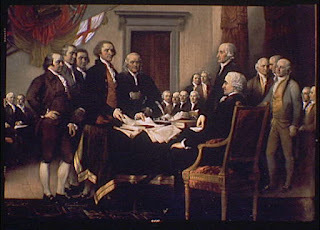 Perhaps they are not on par with the Founding Fathers pictured above, but if they are able to accomplish the plebiscite, a wonderful demonstration of democracy in action. For those of us unable to attend yesterday's Thursday morning RIOC Board Meeting it is now available here as a webcast. Also available is the 8/30/07 RIOC Governance Advisory Committee Meeting intended to establish criteria for future members of the RIOC Board of Directors as well as the June 2007 Board of Directors meeting minutes. Wow. Good job by RIOC in getting this to work. Hope it continues. Also, the webcast of the 9/6/07 Board of Directors meeting is available here. How Well is the Roosevelt Island Operating Corp. Doing It's Job? I'm not a real political person (only voted once), but I'm glad to see Kellner and Lappin taking a real interest in the island. I think Shane has done a great job so far too. Would anonymous please state EXACTLY what Shane has actually DONE not just talked about or taken credit for. I can't wait for this piece of fantasy. One thing that Shane has done that I am aware of is that he has been available to answer questions and respond to issues of concern raised by myself and appears to be open to dialogue with the RI community in general. That in itself in a huge improvement from prior RIOC administrations. Hawk, in your opinion what has RIOC, under Shane, not done that it should be doing and what are they taking unfair credit for. i jog the island a couple of times a week, and since steve shane got here, i've noticed that the seawall at the top of the island is finally getting repaired. plus the movies at southpoint park. plus someone admitting that it's not a good thing to have half of main street storefronts unoccupied. plus someone who seems to be willing to work with rira, related, becker, and anyone else who will approach him as a mature adult. responding to issues;how? What's really CHANGED? How many town meetings has he had? How about NONE. The seawall delay was hung up in insurance disputes. The movies at southpoint were a regular thing except now there are two salaried RIOC employees and an otside company doing what two RI residents used to do for nothing. We'had responsible successful businesses from manhattan practically beg to come here and pay MARKET RATES to open a pizza place, a full scale restaurant and other businesses. Still nothing. And please don't start with starbucks dwayne read and nonnos. Those aere part of a standard deal with Hudson and Related. Wherever H&R build, these outfits get exclusive rights. Part of that deal is having to take the posible losers (like Starbucks here) in return for the sure winners else where. Let's just be sure before we hand out any awards that we know what we're talking about. In essence, the question is whether Roosevelt Island is being managed better under the current RIOC adminstation than previous administrations or is that bar itself much too low? By what standard or measuring device should a non-elected governing body be evaluated? The 1395 sq.ft. 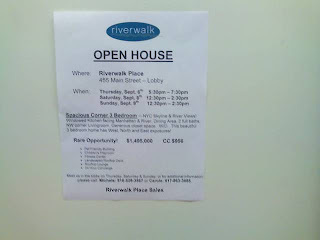 3 bedroom, 2 bath Roosevelt Island condo at 455 Main Street with a $1.495 million asking price that was the subject of this post earlier this week is having another Open House showing Thursday night September 6 as well as Saturday the 8th and Sunday the ninth. 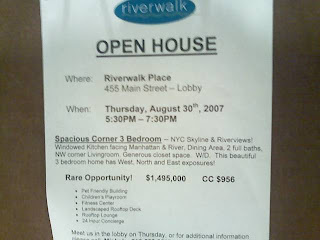 A meeting of the Roosevelt Island Board of Directors will be held this Thursday September 7, 2007 at 9:30 AM at the Good Shephard Center, 543 Main Street. It is unfortunate, to say the least, that this meetings is scheduled at a time when many Roosevelt Island residents are at work and unable to attend. A meeting in the evening would allow many who are interested to attend. Afterwards a town hall meeting could be convened to directly address the issues of concern to Roosevelt Islanders and maybe even receive some answers by those charged with the responsibility to govern Roosevelt Island. Among the issues to be addressed at this meeting are the fate of the Roosevelt Island Tram modernization and maintenance program as well as certain retail leases on Main Street, all issues of great concern to residents of Roosevelt Island. If you are unable to attend perhaps RIOC's webcasting of the meeting will work. Apparently there have been problems to date so the webcast may not be available. It certainly is not available to those without a high speed internet connection. Also, the transcript for the May 2007 Board of Directors Meeting is now available online but the June meeting still is not. I don't understand why it should take so long to post minutes of a public meeting. 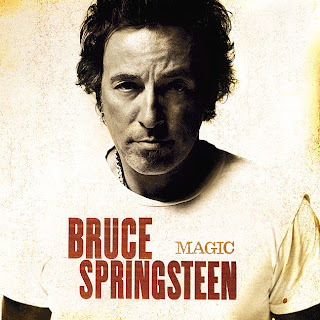 Via Instapundit, Amazon Earworm's Blog has the new Bruce Springsteen & The E Street Band video of "Radio Nowhere". What is the Roosevelt Island connection? None, except I am a fan. A reader who will be moving to Roosevelt Island soon asks for recommendations on Cable and Internet packages. Many thanks for your lovely blog on Roosevelt Island. It is really great to read about the place before actually moving there. I will be moving into Southtown and would appreciate if you have any recommendations on Cable and Internet packages and providers for Southtown. Time Warner Cable and Verizon are the only two companies as of now that provide such service. TW is promoting a Triple Play 50% off of the first two months service for cable tv, high speed online and digital phone. I subscribe to their cable and broadband service but am very leery of digital phone. If the cable service goes out phone service is lost as well so I use Verizon land line phone service although I am seriously considering dropping land line and just going wireless. I am satisfied with the TW cable and Roadrunner broadband service but they can always do better and if a faster system comes along I would give it a shot. I do not know anything about the quality of Verizon's DSL service to Roosevelt Island but understand that their high speed FIOS service may be available here soon. The Octagon building has some additional options though I am not aware of the details. Still confident we’d survive if the cable snapped. Jump up in the air right before it hits the water, hold my breath, swim right through the broken glass, save a couple people, get called a hero in The Post. ...Not so sure about that Gristedes tuna fish last night. 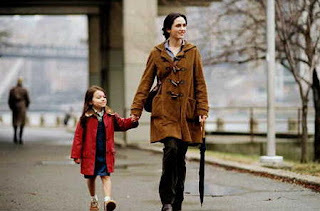 ...Now when you tell them you live on Roosevelt Island, they don’t know what to say because they’ve never been there. ...Lost 10 I.Q. points when I moved to Roosevelt Island but gained it back from the clean living and sitting around watching Sister Wendy videos. ...Roosevelt Island can be a little grim. Maybe like East Germany in the 1970’s. I don't see where on the OHNY site they mention access to the actual Renwick Ruin Smallpox Hospital. RIOC, the State Authority entrusted with the Ruin, would never allow oraginized access to the site as it is not completely stable. The only mention I see on the OHNY site is that The Encampment tent installation will be just South of the Ruin in Southpoint Park. Newyorkology will seek to clarify if such a tour will be permitted. Will F Train Weekend Disruptions Derail Roosevelt Island Late Night Hipster Happenings? Roosevelt Island 360 reports that the F train will not stop at Roosevelt Island between Midnight and 5 AM each Saturday night through Monday morning from September 1 - October 27. The F train will be running on the V line. Roosevelt Island late night hipsters will have to make alternative plans for returning home after their night time partying. Clarification- My mistake. The F train subway disruption only applies to Manhattan bound trains. MTA subway advisory site is here. Update - For F train service and advisory information see the MTA link under Roosevelt Island Transportation in the sidebar to the right. Did anyone go to the 1395 sq.ft. 3 bedroom, 2 bath Open House at 455 Main Street that is pictured above. If so, what do you think? Asking price is $1.495 million. 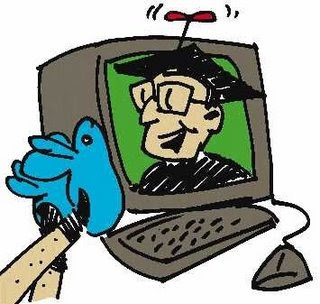 NY Times Real Estate reports that Related Sales has listing but link to Related does not work. No floor plan. Hard to imagine such prices on Roosevelt Island but according to Property Shark several units in the building have sold in excess of $1.5 million including two over $1.6 million. I would think that these apartments are 3 bedroom 2 baths with the very large balconies overlooking Manhattan and the East River but I do not know if the Open House apartment is one of those. Douglas Elliman has a 3 bedroom 2 bath 1411 sq.ft. apartment for sale at $1.27 million though Streeteasy.com reports that it has been on the market for more than 394 days. Elliman site has the floor plan. According to Streeteasy.com this is what is available for $1.5 million with more than 2 bedrooms in NYC. A new two-bedroom 1,000-square-foot condo costs about $820,000, but if the same apartment were located along Third Avenue in Turtle Bay, he said, it could go for $1.2 million. ...Rents, meanwhile, range from $1,700 for a 500-square-foot studio to $4,000 for a 1,400-square-foot three-bedroom, he said. That’s about 20 percent cheaper than the price would be across the river. Well, the coolest thing about it is that there is parkland everywhere. And (today at least) the parkland smells nice. The water smells rather like lakewater (huh? isn't this still the East River?) and there's grassy bits all around the perimeter. Also he finds Roosevelt Islanders to be regular people. As for the people, I saw pretty much everyone. Large immigrant families having barbecues, people with laptops and sketch books... mostly they looked like pretty regular people, not even New Yorker regular, just regular regular... Part of me wants to live here but part of me doesn't think I could stomach the lack of New-York-ness. There *were* a few businesses, but they seemed to be mostly franchise (Starbucks, Duane Reade) not mom-and-pop; the few restaurants looked like the sorts of things you'd find in a suburban strip mall. Still, it's a cool place in a weird way. I definitely want to pack a picnic, a sketch book and go back some nice fall day. He also took the nice picture of the Renwick Ruin above and inquired of the history of the structure. Here is a brief background of the Smallpox hospital (Renwick Ruin) from the Roosevelt Island Historical Society. Located a the southern tip of Roosevelt Island, this fine Gothic Revival structure was originally constructed for the treatment of that "loathsome malady," smallpox, and for many years was New York City's only such institution. It is now a picturesque ruin, one which could readily serve as the setting for a 19th century "Gothic" romance. The construction of a new hospital was under consideration in 1850, at which time smallpox victims were cared for in what Resident Physician William Kelly described as "a pile of poor wooden out houses on the banks of the river." Unlike numerous other medical institutions built by the city on the island in the 19th century, the Smallpox Hospital was not planned exclusively for charity cases. Because of the seriousness and the contagious nature of the disease paying patients were also admitted. Although vaccination against smallpox was common medical practice by the mid-19th century, the disease continued to plague New York city. Smallpox often afflicted recently arrived immigrants, and therefore increasingly more stringent quarantine measures were instituted. As late as 1871 smallpox reached epidemic proportions in new York, while during the Civil War many soldiers as well as immigrants, were stricken with the disease. The Smallpox Hospital (Renwick Ruins) has been designated a landmark by the NYC Landmark Commission. On the basis of a careful consideration of the history, the architecture and other features of this building, the Landmarks Preservation Commission and aesthetic interest and value as part of the development, heritage and cultural characteristics of New York City. The Commission further finds that, among its important qualities, the Smallpox Hospital is a fine example of the crenellated Gothic Revival Style, that it was designed by one of New York's most prominent 19th century architects, that it long served as the only center for the treatment of smallpox in the City, and that it is a romantic and picturesque ruin, evoking memories of the past. 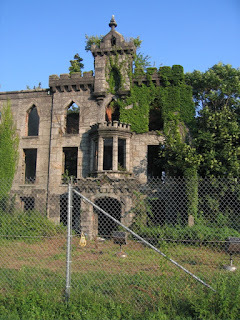 Accordingly, pursuant to the provisions of Chapter 63 of the City of New York and Chapter 8-A of the Administrative Code of the City of New York, the Landmarks Preservation Commission designates as a Landmark the Smallpox Hospital, Roosevelt Island, located near the southern end of the Island, approximately opposite East 52nd Street, Borough of Manhattan, and designates as its related Landmark Site that part of Borough of Manhattan Tax Block Map 1337, Lot 1 on which the described structure is situated. The song is "Oh it is love" by Hellogoodbye. A reader from Italy who found a home here on Roosevelt Island takes us for a stroll on the Roosevelt Island waterfront promenade.